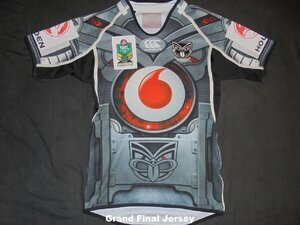 Called the 'Enforcer' by the Warriors and CCC this jersey was widely known as the Terminator by most fans. 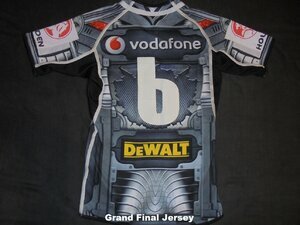 Designed to appeal to children this jersey was a huge success. Both Children's and adult sizes sold well. The club copped some flak for the size of the Vodafone logo. Even more astounding was when CCC confirmed that the logo was originally bigger but Vodafone themselves asked for it to be reduced. OFFICIAL REPLICA - Sold well and there are always one showing up online. Manily in children's sizes. 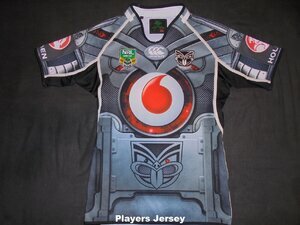 PLAYERS JERSEY - Quite a few variations. 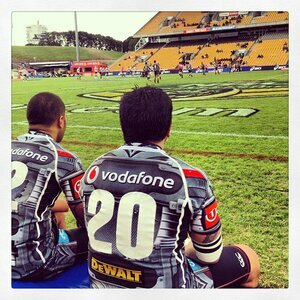 First players jerseys had a red number on the back. Not sure why but these numbers would be replaced by white numbers. I believe it was an issue with visibility. As far as Im aware the jerseys that had the red numbers were simply renumbered so its likely that none still exist. White numbered jerseys are more common but still hard to get. The other variation is the sleeve sponsor. Some have TNT and the others have Holden. 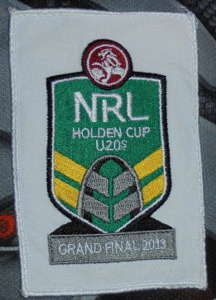 The Holden patch that was sewn on also came in dark grey and white.